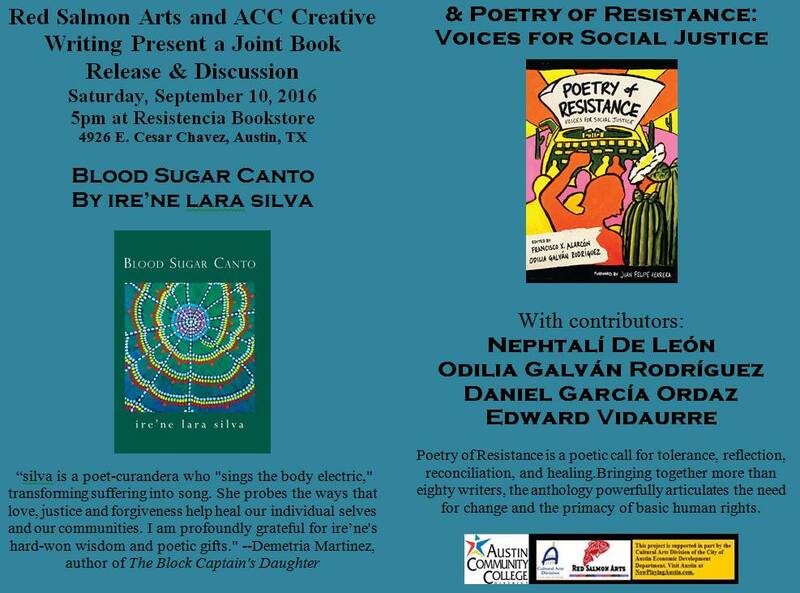 Poetry of Resistance is a poetic call for tolerance, reflection, reconciliation, and healing. Bringing together more than eighty writers, the anthology powerfully articulates the need for change and the primacy of basic human rights. ire’ne lara silva is the author of furia (poetry, Mouthfeel Press, 2010) which received an Honorable Mention for the 2011 International Latino Book Award and flesh to bone (short stories, Aunt Lute Books, 2013) which won the 2013 Premio Aztlán. Her most recent collection of poetry, blood sugar canto, was published by Saddle Road Press in January 2016. ire’ne is the recipient of the 2014 Alfredo Cisneros del Moral Award, the Fiction Finalist for AROHO’s 2013 Gift of Freedom Award, and the 2008 recipient of the Gloria Anzaldua Milagro Award. Nephtalí De León ‭is a Chicano writer known primarily for‬‬ his poetry, children’s stories, and essays. He is also credited with illustrating most of his books. He was born in Laredo, Texas, as the son of migrant workers. Although neither of his parents received much formal education, Nephtalí says that they were responsible for first exposing him to literature. He published his first book —‭ Chicanos: Our Background and Our Pride ‬— during his senior year of high school. He then expanded his work to include poetry and plays, painting murals and illustrating children’s stories. His first children’s book ‭I Will Catch the Sun ‭received great praise. He has been ‬‬published in Mexico, France, the U.S., and Spain, with his writings being translated into several other languages (German, Russian, Chinese, Arabic and Vietnamese). Currently, Nephtali is a full-time poet, writer, and painter who performs lectures and poetry at schools, universities, and community events. Daniel García Ordaz, an emerging voice in Hispanic American poetry, was born in Houston, Texas in 1971 and raised in Mission, Texas. He is an editor of poetry collections, including Insomnia, by Edward Vidaurre. He’s also a teacher, song-writer, former journalist, photographicationisticator, and word-maker-upper. Daniel appears in the documentary, ALTAR: Cruzando fronteras/Building bridges and he was one of five authors and the only poet chosen to participate in the Texas Latino Voices project in 2009 by the Texas Center For The Book, the state affiliate of the Library of Congress. He has also been a featured reader at numerous literary events, including the Dallas International Book Fair. He is also a founder of Art That Heals, Inc. García Ordaz also is a founder of the Rio Grande Valley International Poetry Festival and served in the U.S. Navy as a Hospital Corpsman. Edward Vidaurre is the author of four books. I Took My Barrio On A Road Trip, (Slough Press 2013), Insomnia (El Zarape Press 2014), Beautiful Scars: Elegiac Beat Poems (El Zarape Press 2015), and his latest collection Chicano Blood Transfusion (FlowerSong Books) was published this year. Vidaurre is the founder of Pasta, Poetry, and Vino–a monthly open mic gathering of artists, poets, and musicians.